Build a world in a legendary empire! Eighteen Minutes for an Empire is the sequel to Eight Minutes for an Empire. You do not need the original game to play. In this version, you will choose a card in turn to expand your empire. Eighteen Minutes for an Empire is a short and simple game whose goal is to control areas of the board making difficult decisions. Simple, fast, perfect when you only have a few minutes in front of you. 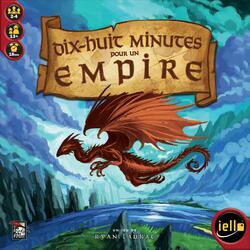 New in Eighteen Minutes for an Empire: Each player has a special ability, the world is populated by fantastic creatures, the game board is modular giving you great replayability, and finally, many variations are possible.